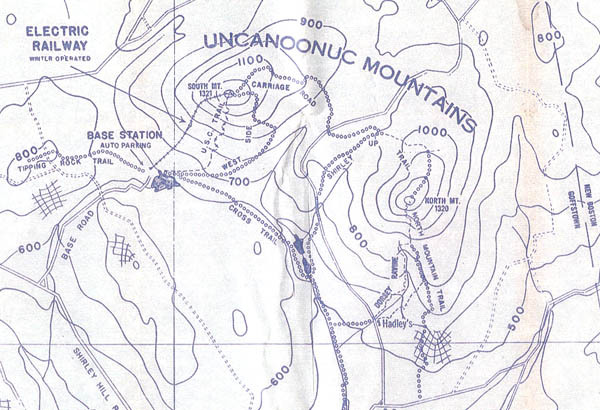 Uncanoonuc Mountain was a historically important Snow Train area - for two reasons! 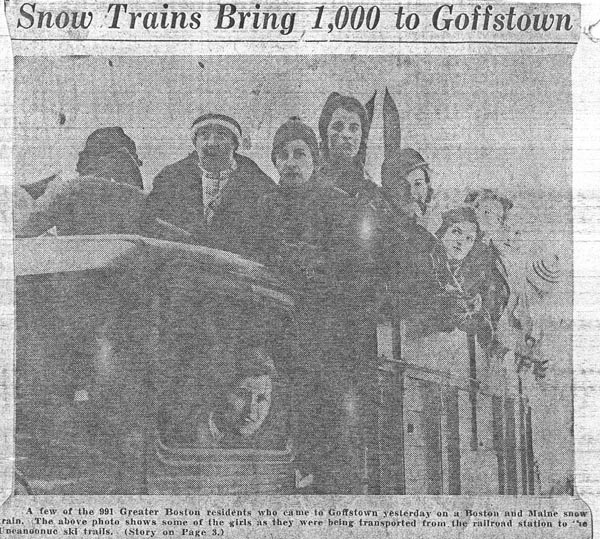 First, many skiers from Massachusetts took a Snow Train to near the mountain, and were then brought to the area. Once at the area, they took one of skiing's only incline railroads (originally built in 1905 as a summer tourist attraction) to the summit. 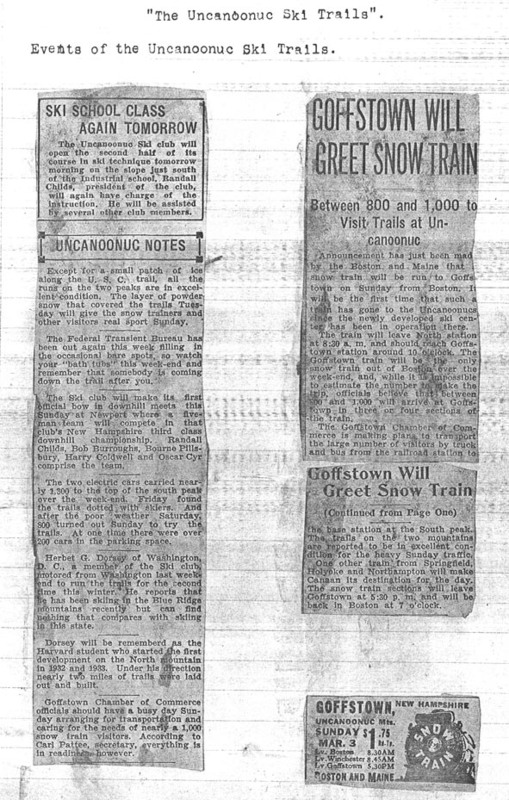 This railroad was similar in concept to the Cog Railway which still operates on Mt. Washington. For more information on the Incline Railroad, click here. The area was developed in the early 1930's with trails being cleared. 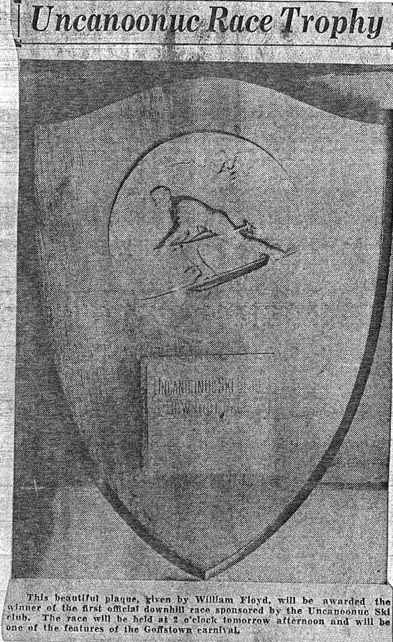 To the best of my research, the railroad begain serving skiers in 1935. If it was a year or two earlier, there could be a good chance that this mountain had the first lift served terrain in New England! Irregardless, it was the first area with a vertical over 200' to be served by a non rope tow. Its vertical was close to 600 feet. Skiers would typically ride the railroad up, ski down, then wait for the next ride up. 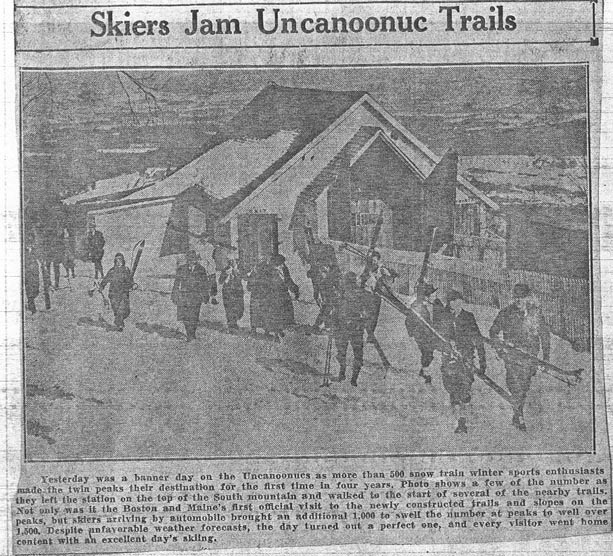 Its maximum capacity was near 300 skiers per hour, and in one day in 1935, 1100 skiers were taken to the summit. There were 3 trails from the top of South Mountain, with several more on North Mountain - but these had to be hiked up. Here is the trail map and guide to the area, courtesy of Brad Dorsey. 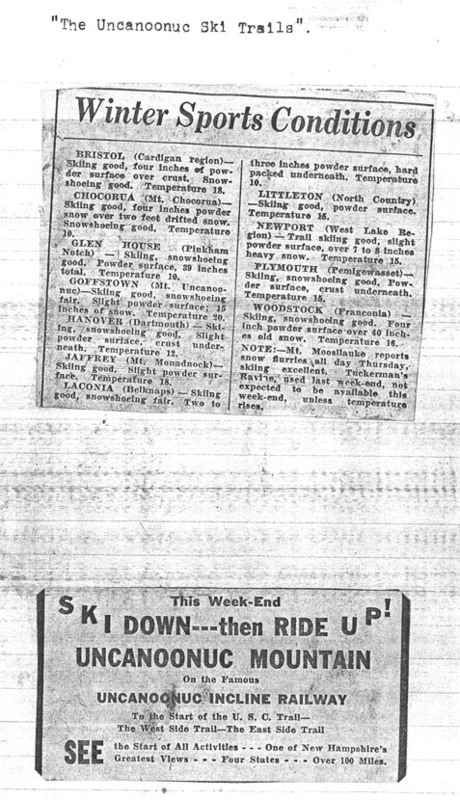 Notice how its dated 1934. 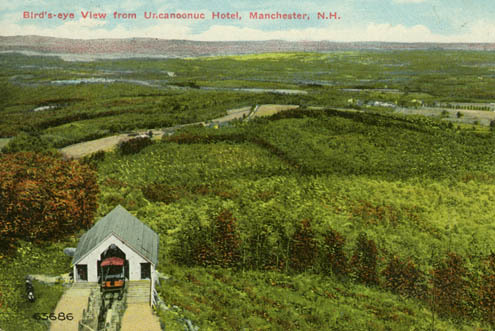 I assume its late 1934 (say December), because if its earlier, this mountain would become the first lift served in New England! 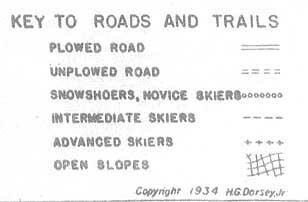 This map is also NELSAP's earliest lift served trail map. For a full description of the trails, click here. 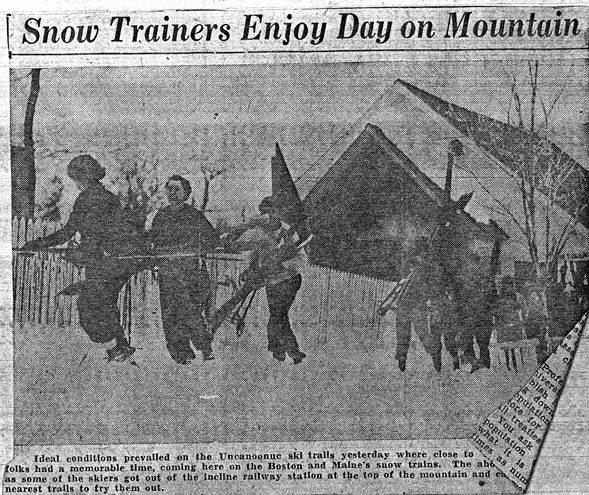 The mountain was really happening during the mid 30's to early 40's, with many races, carnivals, and events taking place. In fact, Robert Backus' father has a brochure describing the area as "'The St. Moritz of America'. This reference is extremely complimentary and well grounded." A stretch but somewhat accurate for this busy place! 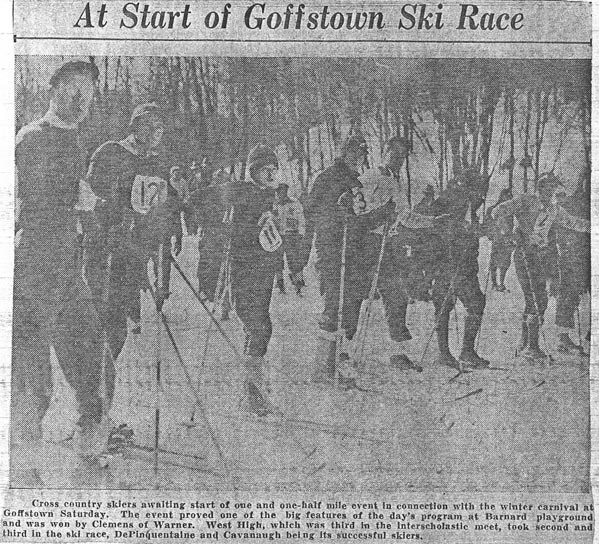 Unfortunately, the area did not operate the Railroad after WWII - but skiers could still hike up and race down. 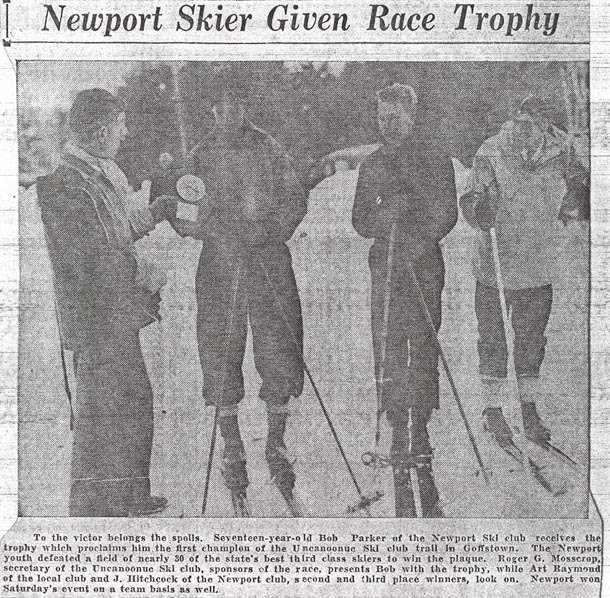 In fact, the USEASA Class C Downhill, slalom, and combine championship was held on Feb 12 and 13, 1949.This gradually wound down, and the area was essentially abandoned for skiing in the 1950's. You can still hike up the mountain. Hike NH has a great website on the area, and can be visited here. 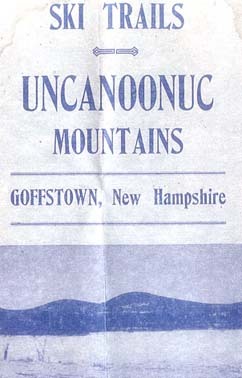 Don Guyer remembers skiing here: Skiing on Uncanoonuc in the thirties and forties meant either a long walk up the slope or, if the train was running, a short ride to the top. There were only 3 important trails that I remember, but if they were named, I'm not sure. What I do remember is that parking at the base was always a challenge, but getting something to eat wasn't so bad. 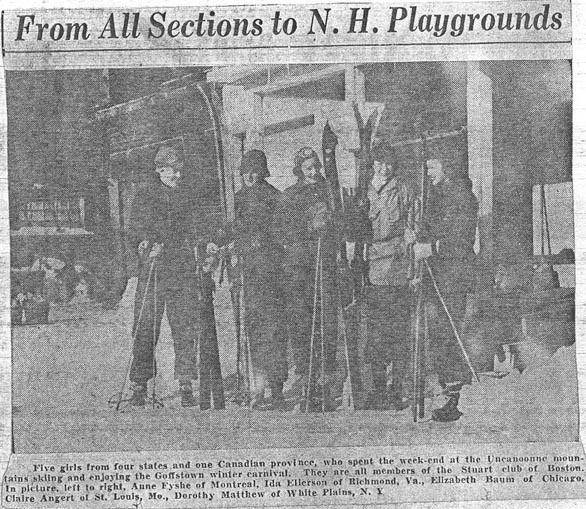 Ernest and Helen Wolf had a small hotdog stand at the base, and in the winter, they invited all the skiers in for hot soup, coffee, and other warming sustenance. Enerst was a skier and he and his family always worked to keep the trails clear, winter and summer. 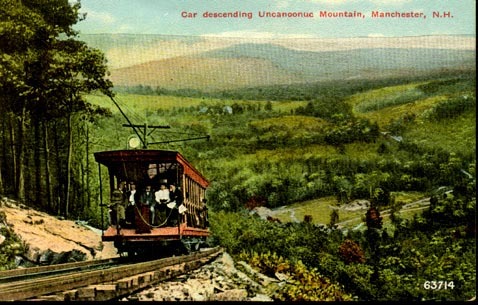 The incline train was also transportation to the houses all the way up the mountain. Our house was the first one after leaving the carbarn. All we had to do was to call out our stop, unload our supplies, ice, and water and we were good for the weekend. Skiing was a real challenge since the skiing side of the mountain often would be blown clear of snow - but there were always some guys to work the snow back in the trails. As I recall, there was never an official organization to oversee the Mt. That was left to the skiers. It was quite a place but politics entered the scene in the early 50's and that ended the skiing, the swimming, and the picnicking around the small pond and on the mountain. It was going to be a town park with all kinds of improvements but that never happened. 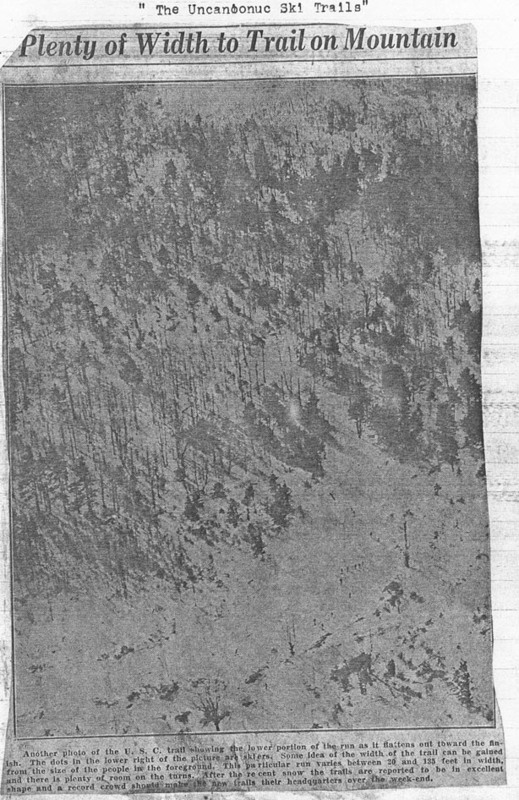 Brad Carr has sent us some terrific personal family clippings of the area that really show how exciting this mountain was. Most are from 1934 and 1935. Some of the info was used in the above history. 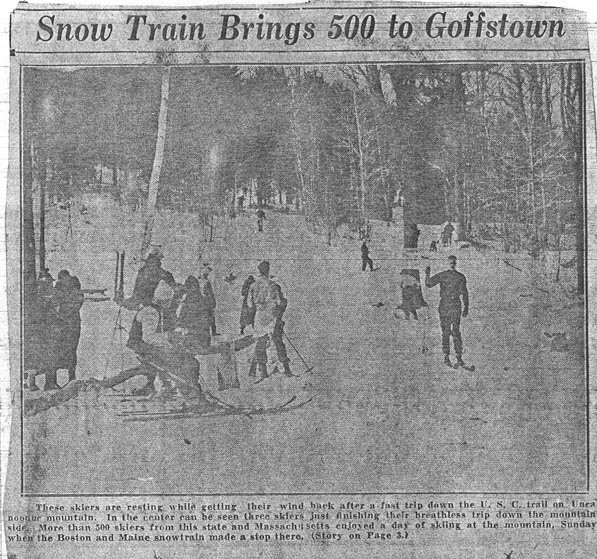 "Snow Train brings 500 to Goffstown"
"Plenty of Width of Trail on Mountain"
"From All Sections to NH Playgrounds"
"Newport Skier Given Race Trophy"
"At Start of Goffstown Ski Race"
"Snow Trainers Enjoy Day on Mountain"
"Snow Trainers Bring 1000 to Goffstown"
"Goffstown provides a network of ski runs for all classes of skiers. From the Base Station the electric Incline Railway may be taken to the South summit. From the South Mountain Summit, three trails may be taken back to the base station. Another trail leads to the North mountain and three additional trails." South Mountain USC Trail-Length 0.75 miles, 26 degree slope. Exposure north, needs 12" of snow to ski. 20-135 feet, vertical drop 700 feet. One section is quite steep, but because of the width it is safe for novices. The railway is within 200' of the trail. West Side Trail-Length 1.25 miles, 15 degree slope. Exposure north and northeast, needs 8" of snow to ski. 20-45 feet wide, vertical 700 feet. Novice trail. East Side Trail-Length 0.75 miles, 30 degree slope. Exposure north and east, needs 12" of snow to ski. 20-40 feet wide, intermediate slope. If you have more info on this mountain, just let us know.